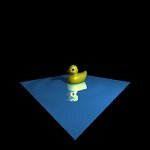 I started this raytracer when I was an undergrad and have slowly developed it over the years. It is designed to be simple, flexible, and fast. I use it for experimenting with graphic techniques. Click and drag to rotate the camera. Use the mouse wheel to zoom in and out. Press ~ or ` to bring up the console. See below for example commands. source code for reference only, not licensed for redistribution. The binaries include a ducky model by Gilles Tran.